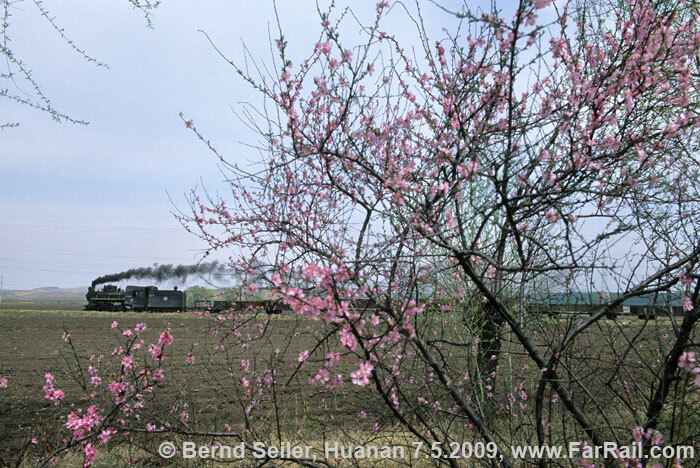 Chilly mornings with white steam exhaust, pleasant temperatures in the afternoon, blossom trees and green meadows all make a much nicer time to visit the last strongholds of narrow gauge steam than the cold and white/grey/brown winter season. The long daylight hours make possible normally impossible pictures, especially the early morning trains which in all other seasons are hidden by the darkness. In the southern part of China it will be warm. 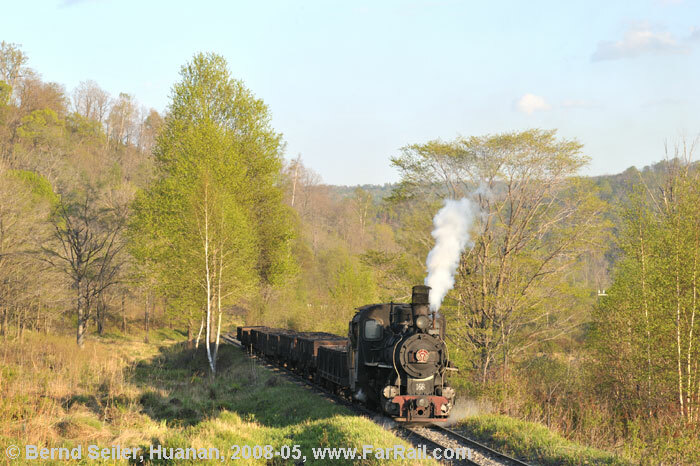 Rumours about construction of a road to Bagou (Shibanxi narrow gauge line) is the reason why we run this tour planned for 2012 a year earlier. No-one can give an exact date, but one thing for sure: time is running out. We’ll probably see all the accessible steam operated narrow gauge lines remaining in China. Yes, only three are left. If you wait any longer, the glory of regular steam operated narrow gauge lines is likely to be completely over. 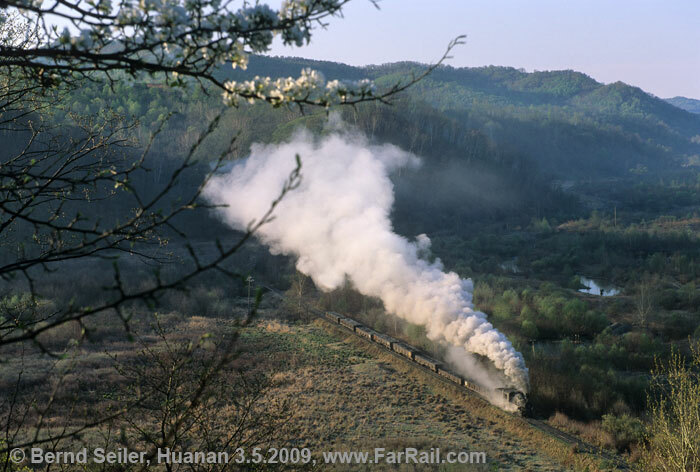 This time we have planned an extended stay in Huanan, the last line in the world with steam hauled and steam banked narrow gauge trains. The little pass is well worth a long stay, although there could be anything from zero to four banked trains during daylight only (on average three). Spring green will be late in the mountains. In May we can expect the first green just showing, while in the lowland areas the first trees should already be in blossom. Farmers with horses and ox carts will be out in the fields, so there is an additional potential for amazingly interesting shots. Farming around Huanan is similar to that found in central Europe over 100 years ago. It’s a journey through time! Afternoon arrival in Chengdu, by charter bus to Yuejin, basic hotel in Yuejin. 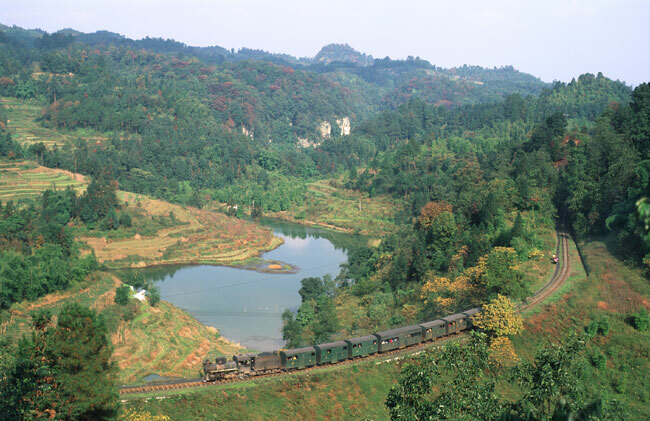 Shibanxi (Jiajang Coal Mine): This is the best known narrow gauge railway in southern China, because of its fascinating train operation and beautiful landscape. The first 2.5 miles are electrified while the remaining very scenic ten miles see steam only. In the middle of the line is a reversal station. Several tunnels, rice paddies, cliffs, lush vegetation and rural villages offer possibilities for plenty of extraordinary pictures. There are four pairs of passenger trains every day, three of them during daylight. 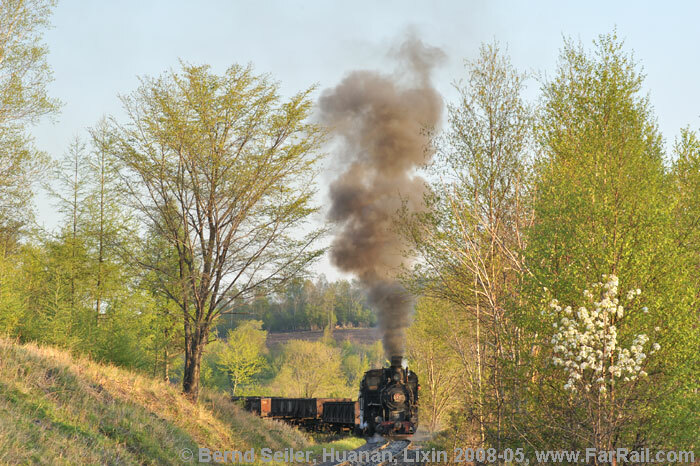 In addition, on the steam operated part of the line, you may see a pair  if you’re lucky two pairs of coal trains. These coal trains run on demand. In 2007 there were between three and twelve freight trains per week. The usual departure time is shortly before or just after the second passenger train in the best morning light. Although there is a very rough road, it’s impossible to chase the trains by bus. So we’ll walk along the line all day. Therefore we use the first train at 7am to go to the summit station at Xianrenxiao. Travelling by train in the tiny, homemade passenger cars is an unforgettable experience. There is no glass in the windows or any kind of lamps in the wagons, just cheerful and friendly people. This experience alone is worth a visit to Shibanxi. From the summit station we will start to walk to the most exciting sites of this beautiful line. 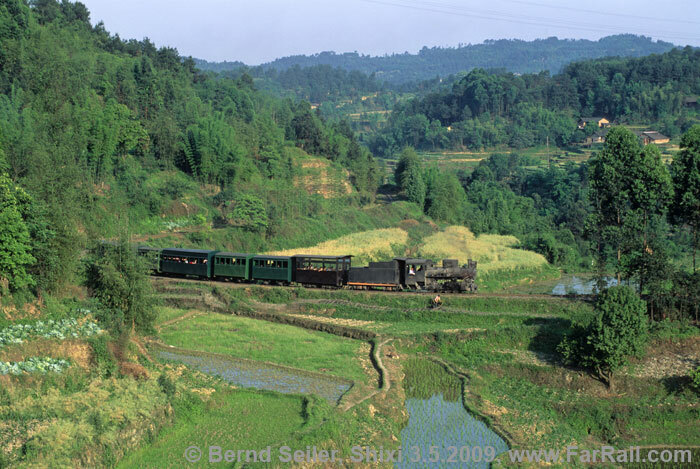 While taking pictures of the bypassing trains you can walk to Bagou, Caiziba, and Mifengyan. There is no “group pressure”, and after travelling along the line by train you can walk to your favourite position in this peaceful area on your own. 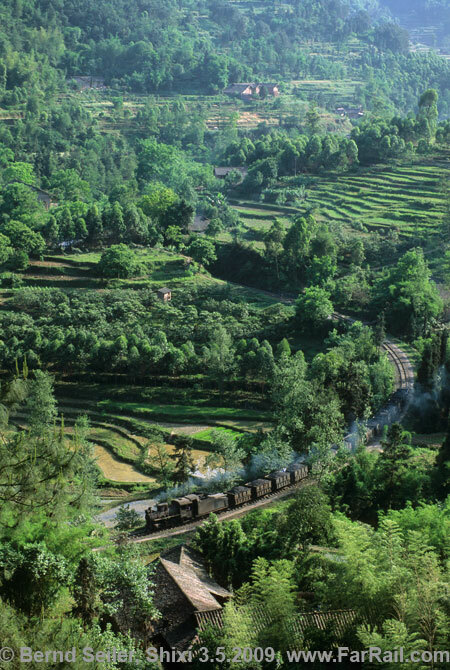 The only thing you should keep in mind  do not miss the last passenger train back to the hotel or the guesthouse in Mifengyan. 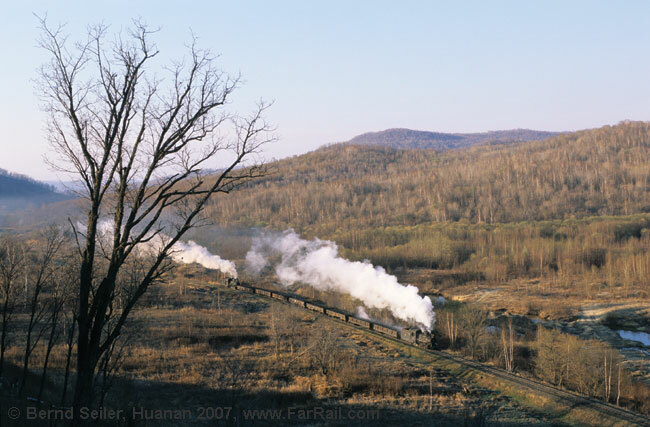 Locomotives are the electric class ZL14-7 and the well-known steam locomotives of class C2. 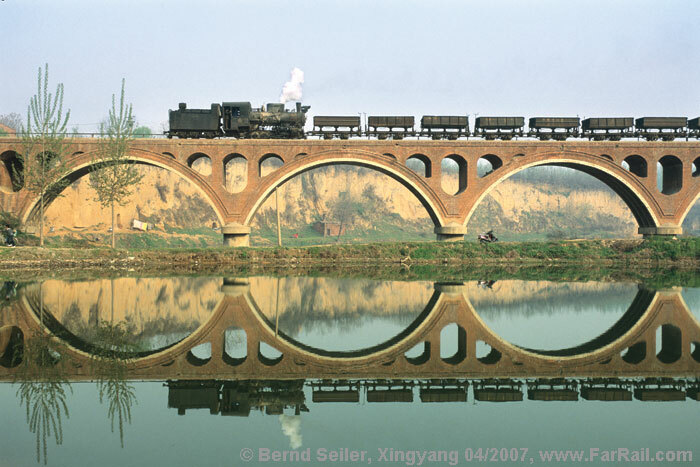 Some of them have a large tender from the closed Pengzhou line while others still have the nice six-wheeler tender. There have been several dates announced for the shut down of this line. Recently the management decided to run this line as a tourist attraction. IN addition, a road to Bagou is planned. Once it’s finished there is no chance for seeing other trains than tourist trains on this line. Therefore there is no time to loose if you want to see the real railway without tourist stuff! They are using some tourist coaches already, which are considered to be ugly to us photographers and videographers. However, so far they have only been used occasionally, most of the passenger trains being still unspoiled by these glass boxes At least all the freight trains are still a sight worth seeing. Optionally you can stay overnight in the lovely guesthouse of the doctor in Mifengyan. This is where the fascinating reversal station is located. 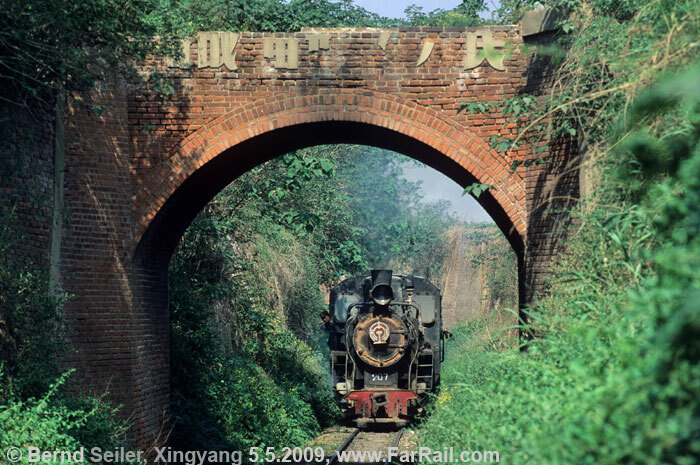 Xingyang has a big brickworks which operates its own narrow gauge railway to the clay quarry. The line passes an unusual area with deeply eroded valleys. The most interesting spot is a nice arched bridge built of bricks. The bridge spans some large ponds, which give several very good opportunities. If the railway is working, we can see about six pairs of trains. Unfortunately operations are difficult to predict, and there are several reasons for closing down the work for several days at a time. When rain makes the clay too wet, when technical problems occur, or when there are too many piles of unsold bricks around, there may be no traffic. According to the chief of the brickworks, the railway has a more or less safe future until the end of 2010. After this date even he doesn’t know what will happen. Consider being either one of the last visitors to this fascinating little line or, otherwise, we may see nothing! We may need to change our plans which could involve extra costs for changing domestic flights. It’s regular operation, nothing can be guaranteed! 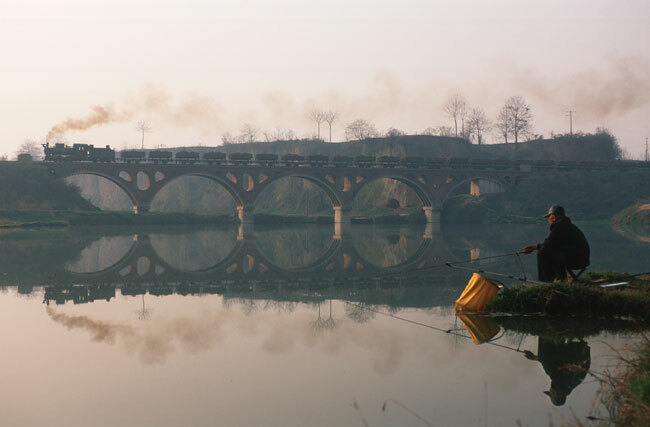 Once Huanan was the starting point of a large forestry railway system. 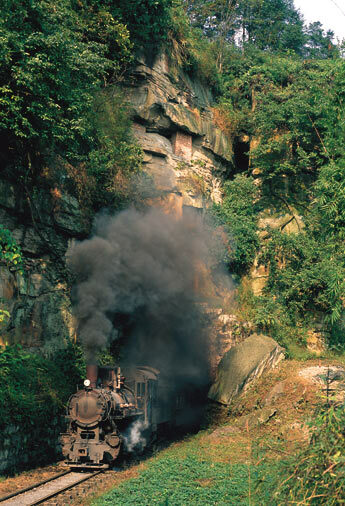 This 762 mm narrow gauge railway survived because of the existence of some small coal mines 46 km east of Huanan. The remaining line climbs over a pass some 2 miles west of Lixin. From both sides there are steep gradients and sharp curves. The gradient against loaded coal trains is so steep, that every loaded train needs a banker at the rear end of the eight wagon trains. 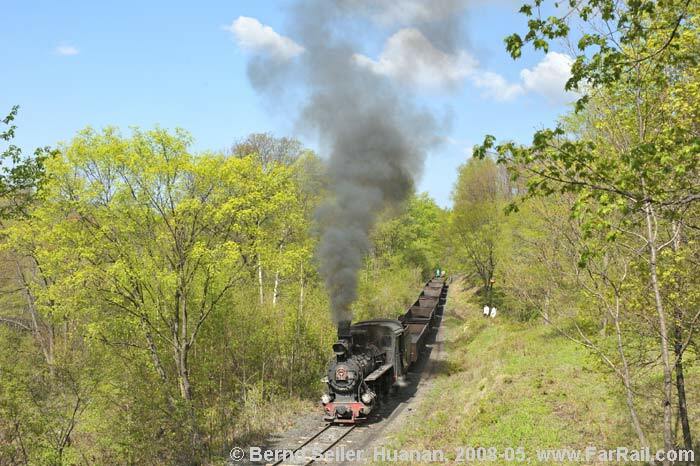 This operation is the last known regularly banked narrow gauge steam train in the world! We’ll spend much time here because it’s such a long way to get there, the scenery is very diverse and attractive, and only two to four pairs of trains run during daylight. The distance between Tuoyaozi and Lixin is approximately seven miles. As there is no passable road we have either to walk or use private motorbikes. The use of local motorbikes is optional but not really recommended. If you know the style of driving in China you can imagine what I mean. Either way, it’s everybody’s own decision. Walking some miles in a whole day is not that far on a beautiful spring day. Motorbike transport in Huanan is not included in the tour price. Unfortunately, the only accommodation possible in Lixin is in a filthy private house with no facilities at all. This is the place where the trains get their bankers on the rear. In addition there are wonderful photo positions close to Lixin. Because of this, it is worth spending two nights in such poor surroundings, where the locals suffer the whole year. You can choose to spend the night in the good hotel in Huanan if you prefer, but you’ll very likely miss the possibility of getting a banked morning train. In addition, the experience of seeing and listening to a steam hauled and banked train in the moonlight when no other noise is disturbing the scenery is an incredible moment. Don’t miss it! In case Huanan is having one of its occasional operating breaks, we have the alternative of Jixi with its standard gauge SYs. The tour was planned in Summer 2010. Although it’s only a few months before we go to China it’s not certain that all lines will still have steam or be in operation. In the case that a line has been dieselised or closed before we arrive, we will make different arrangements to see as much narrow gauge steam as possible. However, it’s not possible to guarantee anything,. This is real steam operation, so things are mainly beyond our control! We expect the lowest morning temperatures to be a little above zero degrees Centigrade (about 32 degrees F) in the far north while afternoon temperatures can still reach more than 25 degrees Centigrade (mid-to high 70s F). In the Sichuan province temperatures may exceed even 35°C/95 degrees F.
The voltage in China is 220 Volts, 50 Hertz. Sometimes you need an adapter for the power outlets. China uses the European mobile phone (GSM) standard. This tour is designed for both dedicated photographers and video filmmakers. Our philosophy is to provide opportunities to get that perfect sunrise shot rather than a time consuming 5-star breakfast buffet. On occasions lunch will be served as a packed meal. Beverages are not included in the tour price. Hotels, charter buses and trains represent the standard of our host country, which may deviate from European and American expectations. While we will endeavour to avoid long walks, some photo positions may require an extra but worthwhile effort. The hotels used will be of medium class, but in remote areas sometimes they are more basic. We offer a unique opportunity in Lixin: if you can stand the lack of comfort you can sleep in one of the private houses around there. To give such a room type a rating, we extended the category-system of how to rate a hotel’s service and comfort to the bottom end. Zero stars would be too good. The accommodation in Lixin on the Huanan system is another matter. There are facilities outside but they can hardly be recommended. Better to go into the forest! If you ask somebody about washing your hands he would point to a bowl with some water in  sometimes used by several others before. If you want something clean to wash in, you have to ask for fresh water or do it as the locals do  go to the river! The accommodation and the bedding can hardly be described as clean. So you should bring a towel to put under your head or a light linen sleeping bag or sheet. With this equipment you can easily stand one night in circumstances that the locals have to use all their lives. The accommodation in Lixin is rated by us as three black holes. By the way, from four black holes onwards you would have to share your bed with small animals you might not appreciate. But for sure, this category is not on offer on FarRail trips. More seriously, it is very basic, but acceptable for most travellers and the rewards of being so close to the railway are wonderful. We’ll sleep on Kangs, these are sleeping platforms with a built in stove, so they are warm and quite comfortable. You’ll get some covers to put on the stove to soften it a bit. Most of the participants on other trips who have used this kind of a bed have been really surprised how well they slept! All who have spent a night in Lixin on past trips have rated this experience very highly. No one will remember another faceless three star hotel in a city, but when you’re staying in the total tranquillity of the forests around Lixin, sleeping on a well heated stove, and a train sets off to the summit, you can hear the two locomotives for almost half an hour, climbing up the hill. On a bright, starry night it’s a memorable experience. If you are uncomfortable with the private houses in Lixin we can arrange the hotel in Huanan for you instead (at no additional cost). The train rides are booked in soft sleeper class (closed four berth compartments). As the reservation system in China is a typical quota system where the station of origin typically gets an allotment of 50% of the available tickets, it is not guaranteed that we can get soft sleeper tickets for all our rides. In such cases we’ll use hard sleeper class, which, however, is not as hard as the name suggests. Hard sleeper compartments are open and normally comprise six berths. Short daytime trains may have to be booked in hard seats (if available). Hygienic and environmental standards in China do not conform to European or American expectations. Carrying some toiletries in your photo bag is hence advisable. Please bear in mind that accommodation and transportation in China falls short of EU/US safety standards. Always use common sense when crossing roads and railway tracks. FarRail Tours cannot be held responsible and will not accept any liability whatsoever in the case of any accident or damage. We suggest you take out a comprehensive overseas accident and health insurance policy.